A Move from Statistical Significance? Consumer Research on Life Support? Word is out that Google's virtual world's platform, called Lively is aimed at an eventual presence in online games. I have only taken a brief look at Lively and was not overly impressed, more like a 3D chat. I still think of games as a form of directed simulation, ultimately good for staging scenarios for business. There are examples of that but it is still too hard to set up and deliver specific applications. Update: See also a post about the recent talk by MS's Craig Mundie on the future of virtual worlds. A short article on Social Networking watchouts. These companies showcase their products, services and samples as gifts, so you can enjoy them 100% free. Using a Patent Pending countdown format, Freefroot keeps the give-aways exclusive, spontaneous and fun - just how a give-away should be! Recipe suggestion kiosks are becoming more common in grocery. Shoptocook is one of the best known vendors. Well done implementations. Here is a recent implementation at Schnucks. Google discusses the current state of their language translation services. They now support translation to and from 34 languages. Along the way they admit that natural languages are hard, a clear example of why the most important aspects of artificial intelligence are some time away. I applaud their continuing work in langauges. I have used their translation services a number of times. I know only two languages well enough to judge their accuracy, and what I get provides the gist of the text, but I would be very careful before using it for anything important. An approach to doing 3D mapping with drones. A bit back I wrote about the book: Whiff! The Revolution of Scent Communication the Information Age. Still have not read it but it is getting closer. I just discovered the book and the guys behind it have a site called Ask the Whiff! Guys. You can download a book chapter. The site contains lots of smell-sensory videos, news notes and applications. One of the most interesting, a scent-based discovery that could help stop MRSA infections in hospitals. Scent is more than just retail. More posts here on scent. Brandweek on Captive Beauty Brands, redefining private label and competing with the big brands. My background and practice have been about quantitative analysis of many different forms. Before you do any kind of analysis you have to have data. To have any kind of data you have to measure something. This book makes the point that most anything can be measured. We had a course called 'economic analysis', which tried to cover some if the same things, but this book does a better job. The author provides a number of rules-of-thumb than can be useful to anyone. I particularly like the section that deals with calibration in measurement when using multiple human experts. Very nicely explained and useful. Not many equations, but the individual sections need to be carefully read, so this is still not the book for just handing out to managers. His general modeling philosophy reminds me of the work of Sam Savage. He makes a good case for really understanding the economics of the information that you are gathering. What does it cost to gather the information and what value will be provided by various levels of reducing model uncertainty? What is the difference between expected value of information and the expected value of perfect information? I have rarely see this concept covered. Another section deals with the ever important problem of how many samples or measurements you need to come up with for a useful model. Often people would come to me with a half dozen measurements and I would recite the statistics litany that you needed more measurements to get statistically valid results. Hubbard makes a good case that such results are rarely measured outside of a context and you can get valuable knowledge from just a few measurements. 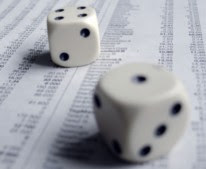 More 'modern' Bayesian and Prediction Market methods are well outlined. He also describes the Internet as an instrument, and how sources like the Wikipedia can be used, with care, as a way to construct data models. He also cautions about methods that will add error to initial estimates. Some good Excel examples of applications, though he should have provided more and moved them to an appendix. A section on using human experts to make judgement is useful since often measurements of intangibles are in people's heads, and you have to consider how non-rational and non-cognitive elements of their opinions will influence the results. The book is based on years of practical applications, good practical examples throughout. I highly recommend this book for the practitioner.
" .... 3D store environment was stitched together with Photosynth technology and interactive. Mundie could "walk" through the store and have a text or voice conversation with a store representative or someone, such as his wife, via his buddy list. In addition, he could watch videos and examine 3D models of the art objects, spinning them around to look at all the different parts of a sculpture. Then he showed how a smart handheld device could be used to navigate in a physical space. Pointing the device at a particular space would show local information, such as when buses were expected to arrive or what stores are having sales that would be of interest to the user based on their profile ... "
Update: A rare serious discussion in the Second Life Herald on Mundie's talk. Will the virtual worlds (and realistic simulations) of the future be 'photo-synthesized', or will they be cartoonish like SL? Or a mix of the two? Harald H. Vogt points me to the Scent Marketing Institute." ... Our mission is to serve as a destination for information, research, events, education, advice and discussion regarding the use of scent in marketing strategies and branding programs. We also represent the industry in helping to establish guidelines and ethical standards for using scent technologies responsibly and advocate for the industry’s acceptance and growth... "
How effective is fear factor marketing? "Visa has become the latest player to try and start a fire under mobile payments and mobile commerce, a concept that in the U.S. has remained mostly in the imagination over the last decade. Visa's first partners in its roll-out are Nokia and Google's Android platform. Its partnership with a major credit company is a win for Google's fledgling mobile operating system ... "
Shopper marketing programs are advancing. Good book on the inconsistencies of the human mind: Kluge: The Haphazard Construction of the Human Mind, by Gary Marcus. A kluge is an engineering term for a haphazard, even clumsy and inelegant solution to a problem that can show its limitations. At the end of the book the author provides suggestions for patching our kluge. The Wall Street Journal seems to be competing with other professionally positioned social networks like Linkedin with a new social network service. Of course the WSJ is one of the few news and information services that is successful with a for-pay model. Can they achieve enough participants in this model to make it work?
" ... In a blog post describing the new social network, the Journal billed the social networking features as a "nifty" way for business owners to connect in a Web 2.0 world. "These new social-networking features should enable you to meet and swap tips with other entrepreneurs and find answers to questions that help you better run your business," it noted.... "
Fan of the modeling and quantification of language. The WSJ Numbers Guy posts about the measurement of the use of words in English. I like his use of copious links, that is the way the Web should work. The appearance of 'black box' recorders in automobiles is starting to raise privacy concerns. Met with the very impressive Warsaw Poland-based company LAB today. " ... LAB consists of persons who consider think different as life philosophy. Therefore a few years ago we decided to apply test different philosophy to consumer research. We adapt cutting-edge scientific knowledge into advertising environment. We create reliable instruments to explore consumers' unconscious mind – therefore we can better understand and predict their purchase drivers and motivators... ". Android G1 versus the IPhone, a quick video comparison. Also, more hands on. A colleague points to the book: Scoring Points: How Tesco Continues to Win Customer Loyalty, by Clive Humby, Terry Hunt and Tim Phillips. You may recognize one of the authors as a founder of consumer analytics vendor Dunn-Humby. Have not read but he Amazon link has a look-inside-the-book link. Also, the book's Web site. 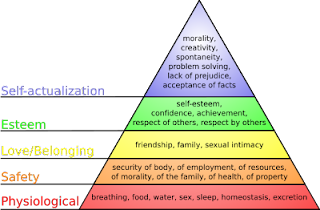 I have been surprised when talking to clients that they have not heard of Abraham Maslow's Hierarchy of Needs. A simple and fundamental guide for thinking about the needs of consumers. It has been much tweaked and extended over the years, but everyone should know the basic idea. It can often form the basis for conversations about many kinds of consumption. SasCom magazine's blog makes the point that the hierarchy is not just about consumer goods and has a short post about its application to business intelligence. See the WP, which gives a good overview of the hierarchy of needs and lots of detail and links. Have been involved with future home developments for years and found this idea interesting. Replacing your house key with your cell phone. The cost is high, but I am interested in moving to a 'single personal device' mode. It is an attractive idea. Wallet, personal computing, sensor, location, keys, etc. Lots of simple, very cheap infrastructure to be changed before we will not need any keys. It surprises me that only 10% of college admission officers had looked at an applicant's Myspace or other social networking site. Further the implication was that they had only looked at some applicant's sites. For example, a student might have mentioned the site on their application. Or simple curiosity? Was it only in those cases? Thus a very small percentage. Via Slashdot, which had previously posted about the same practice of employers. These sites are public and should be fair game. When I meet someone for the first time it is one of the first things I do. Students should learn that. I don't remember recall having ever smelled anything in a dream. When I first saw this post Perchance to Dream, I thought it was about exposing people to smells and that being reflected in their dreams. Marketing extending beyond sleep? No it is about people being exposed to smells during REM sleep and how they reacted in their dreams. Still very interesting. More posts on my favorite often hidden sense. Would like to have further seen brain scans during the same activities. I see that Amazon has launched their Video on Demand. Cisco and Sun among others are forming the IPSO alliance (Internet Protocol for Smart Objects) to promote an Internet of things. I was introduced to this idea at MIT in the early 2000s. Lots of interesting benefits to the direction. I am also convinced that there are mobile components to the idea, a recent example I posted about was Kooaba. Will continue to follow IPSO. VisualComplexity has a link and abstract to work being done to simplify very complex graphical displays. I also scanned and read part of the original (very) technical paper. The paper was not quite what I expected, less directly practical, but did make me think about cases where I have had to work with very densely connected, generated graphs. 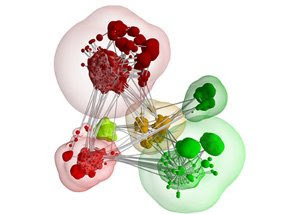 The large scale relationship patterns can be seen but are hard to leverage. The visual results can be very strikingly beautiful in a mathematical sense. The beauty of the visualization, however striking, is usually not very useful. Algorithms can traverse the results, aggregate results and come up with conclusions. Our brains and visual systems have a much harder time with multi-dimensional spaces. Thus the pressure to simplify. We think at most in 3D, and even then rather poorly. Even mundane business data quickly bubbles into many dimensions and the best you can do is slice it into pieces that themselves need to be categorized. Packages like Spotfire and Miner3D give you a chance at making sense of the results, but it is easy to spin off in a realm that is incomprehensible to business users. We did experiments with virtual world means to explore data, but there is little improvement when immersing yourself in the data. Still looking for solutions.
" ... enables Walgreens' warehouse management system to automatically send out advance shipment notices as products leave the center. Altogether, the system includes 170,000 plastic totes fitted with EPC Gen 2 passive RFID tags, some tagged dollies and 45 Blue Vector RFID portals installed at dock doors and other locations around the center ... is designed to alert employees when a tote has been moved to the wrong dock door, and when it is being loaded in the incorrect order. For instance, often a truck will transport multiple shipments to several stores and needs to have the goods loaded in the order in which they will be delivered ... "
A positive review of Whiff! The Revolution of Scent Communication in the Information Age, by C. Russell Brumfield. Have been involved with a number of scent driven projects and it is an under used and hard to control sense. "... we are on the verge of an age in which almost every product and environment is imbued with an appropriate scent. That scent might be designed to evoke a particular emotion, or send a branding message. He even thinks scent could provide directional cues to help shoppers navigate complex mall environments ... ". It's on my reading list. See my previous review of the related book:What the Nose Knows. Update: In the comments the author provides some more details about their direction in smell science. Google co-founder Sergey Brin is now posting on his blog: Too. In th early 2000s we examined the use of Webcams to understand and analyze consumer behavior. Attracted by their broad and serendipitous use, we thought of building a camera network that would help us understand shoppers in retail. Shoppers in the wild. Eventually we shelved the idea, realizing that there were serious privacy issues. I still do like the concept. Security and information delivery applications continue to explode. Companies like Videomining are doing what we hoped to do then, building libraries and analyses of comparative consumer behavior. This article gives a good update of what is going on today with webcams. Stanford is offering free computer science and robotics courses. Consumer Goods Technology is running a survey on product traceability." ... Food and beverage companies have been acutely aware of the severity of the issue, with over 900 food-related investigations and recalls in the last 18 months, including high profile ones such as beef, spinach, and tomatoes. However, traceability concerns now permeate most product categories. This survey examines the drivers behind traceability initiatives, how recalls are currently conducted, and the technology used to support the process... ". Interesting item. Also useful to see the full article to understand the actual form of this experiment. It is also the case that Fmri scans show considerable variance in person-to-person results. Interpreting that could be key to understanding these kinds of results.
" .. While having the study participants multitask, Leber and his colleagues at Yale University monitored their brain activity using functional magnetic resonance imaging (fMRI). The research confirmed that multitasking is, on average, inefficient. However, the brain scans allowed the researchers to predict when people would be poor multitaskers and optimal multitaskers ... "
Also points to a broader study.
" ... The creator of the world wide web, Tim Berners-Lee, has made an odd request: for a kind of rating system to help people distinguish sites that can be trusted to tell the truth, and those that can't. Berners-Lee was speaking at the launch of the World Wide Web Foundation, which aims to ensure that everyone in the world benefits as the web evolves. I saw several Kiosks at my local Kroger this week. One handling Deli orders. 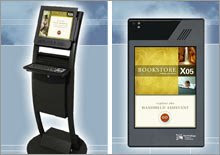 It seems that consumers are being increasingly turned to kiosk delivered services. Note the previous example at Wal-Mart. That alone should make many other retailers look at this. Another example is that Giant Eagle is installing IBM Anywhere kiosks in Giant Eagle stores. " ... NextChoice’s NextWave self-service software suite, which unifies customer ordering and payment with the collection and management of transaction data and preferences ... " . Also a case study at Hannaford. Kooaba is a mobile image search engine that now has a version for the IPhone. Like 2-D barcode applications, it can be used with a mobile phone's camera to 'image' something, say a poster, and link it to mobile content like a web site. Unlike barcodes it does not require you to paste a cryptic code on a poster, it recognizes the image itself. Remember this very obtrusive 2D barcode example. Would be nice if Kooaba worked on bar codes as well. To get people comfortable with using their mobile phones to extract information from an object, though only after there was a critical mass of things to link to. The objects scanned don't need to be flat images, but can also be things like buildings. Also has an API to serve up images. Tested it on the movie posters they give on the web site, not yet on images I supply. Even with Wi-Fi it took a minute plus to send and analyze the image. I did have to retake some of the photos. Some other use cases. Based on work at ETH Zurich, KU Leuven and Toyota Motor. Worth a closer look. Surely an enabler of an internet of things. Here also is Kooaba's blog. Edgelings will be live blogging the Web 2.0 Conference in NYC starting today. I did not know what a social IPO was, but Steve King gives us an instructive example in the recent launch of dosomething.org. The projects being suggested do seem very risky from an investment perspective and more like philanthropy. In a recent post by correspondent Steve King: Are Statistically Significant Research Methods Passe?. " ... A growing number of surveys are being based on informal groups of respondents rather than statistically significant population samples ... ". Speaking about the use of questionnaires. I comment at his post as well, where I agree it is a growing trend. 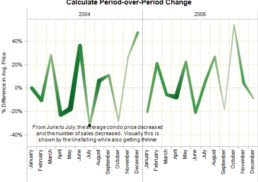 It is also like the trend of design versus quantitative analyses. Like the 'Blink' hypothesis. A form of generate-and-test, but do not forget the test. Classic statistically sound methods are still important. It is OK to use roughly exploratory methods to understand the landscape, but not to make the big decisions. See related previous post, which suggests that chat is more important than carefully directed instruments. Online chatter is becoming more important, but classical methods of consumer research do still allow you to shape the kind of knowledge you are trying to get. So both are important and should be integrated in new ways. Bob Garfield in AdAge on the future of data-based marketing: Data With Destiny. A bit rambling, but interesting comments on the current state of marketing and advertising. Can the data speak for itself? What can we do to help? Please save me from using the Wanamaker conundrum example again ... You know it, we waste half of our advertising dollars, we just don't know which half. Tim Berners-Lee, inventor of the web, has formed a foundation to " ... Through research, technology development and the application of the Web for the benefit of underserved communities, the foundation seeks to enable all people to share knowledge, access services, conduct commerce, participate in good governance, and communicate in creative ways ... "
Paul Gillin writes about an article on the rapid adoption of social networks by the enterprise. With pointers to the original article. A proposed Web and Twitter based disaster reporting system. Meijer Online Service. Similar order and pickup approaches have been tried at some Wal-Mart stores, eliminating the complexity of delivery.
" ... Meijer, Inc. has unveiled a new service -- "Grocery Express" -- at one of its stores. The service enables shoppers to select grocery and health and beauty care products online, and then have them delivered directly to their car at a designated location in the Meijer parking lot ... "
Esquire magazine collaborates with E-Ink Corp to produce a magazine cover. The cover is examined in technical detail. Attracts attention like a digital billboard. Largely colorless in the image, though have not seen the live cover. Have seen demonstrations of e-ink for general packaging, but the very high cost is still prohibitive. We tested E-Ink for potential low power in-store signage options. E-Ink's press release. Have been involved with the whole concept of tagging photos of late. Walter Mossberg has posted an article on updates to photo service Picasa that allow you to recognize and tag photos that have facial images, plus other changes. The general problem of image tagging is unsolved. Initially aimed at college students, I have followed the P&G laundry 'replacement' initiative Swash in a test in Columbus Ohio last fall. Now it is in test again in Lexington KY. Not meant to replace laundering, but extend the time between washing. More on Swash. 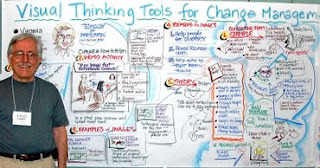 David Sibbet reports from the recent 13th International Visual Practitioners Forum. Good view of what is going on in this world. While most of us, like myself, use a computing crutch, this is a meeting of true artists devoted to making complex things simple via drawings and also understandable well after the fact. The latter can also be tricky. I have seen Sibbet and his colleagues do this work many times and the results are beautiful. Example here. Global standards body GS1 has just released a very useful position paper on mobile bar codes. Good examples and standardization comments. Accompanying press release. See my recent post on how Ralph Lauren is using these. Georgia Tech's Product Creation Network, PCN, of which I am a part. See more about the effort at the site. Let us know if you want to fund this. True, the 50 year old icon has spent his entire life standing behind a housewife supporting her by folding his arms. Few will remember it, but for a short time in the early 90s he spoke, giving cleaning advice. His first words were chosen in a contest. Then shortly afterward he became mute again with no explanation. At least now he works.
" ... Our vision is that hardware and software platform for Personal Robotics – robots that do tasks for humans in human environments – will enable breakthrough robotics applications, much as PCs and DOS enabled a new set of computing applications two decades ago ... "
See also video of Stanford's personal robotics program. Impressive, but there is a warning at the bottom of the video that says that the robots are being tele-operated. They are not autonomous. I have yet to see an useful autonomous robot in a domestic environment, other than the very narrowly focused Roomba.
" .. Polo Ralph Lauren has launched a mobile commerce project in the United States that pushes its homegrown version of 2-D bar codes, with its Quick Response (QR) codes appearing initially on print advertisements. Some are questioning, though, whether the chain's lower priced approach might limit the number of consumer phones that can access the related content..."
Much more in his post. Have examined the idea of 2D bar codes on print ads, packaging, posters and even T-shirts a number of times. As I have said before, it's a matter of standardization of codes for the cameras on common cell phones that will make this work. People still do not understand it because they have not seen many examples. Also, note the example above, don't think you will get many people to stop. And it also trashes the image. Andrea Saveri, often mentioned here, is moving from IFTF, she writes: " ... I will be spending more of my online time at cooperation commons, a group that is interested in cooperation, collective action, and new commons from theoretical, technical, and practical perspectives.... "
Good video overview of data visualization approaches. Includes links to Stephen Few's slides. 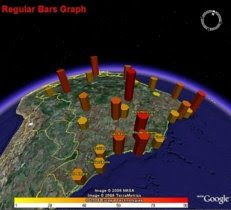 His blog is: Visual Business Intelligence, includes a review of Xcelsius Present, previously my review. A sneak-peak into the topic of his new unreleased book, Stephen Few highlights fundamental principles and practices for visual data analysis. Typical of Stephen, this session is broad in its appeal — designed for non-statisticians and statisticians alike – yet all walk away with new insights. - From the Tableau Customer Conference ... "
Stephen Few is a strong proponent of simplification rather than ornamentation for effective knowledge delivery through visual perspection. His talk is an excellent introduction. I continue to look at best ways to effectively apply business intelligence (BI) in the enterprise. The CW article linked to below is a good overview. I am not sure that BI needs to be saved, but rather its interfaces and solution flow need to be made usable by those with the actual problems. We are getting closer, but there is much to be done. Mash-ups make certain kinds of applications easier to set up and deliver, at least at the prototype stage. They do not make it necessarily easier for the expert to solve their own problems. With those cautions, a good overview read which gave some approaches to examine more deeply. Lots of geo visual examples. Can Web 2.0 save BI? Mashups could be the answer to BI's problems. Here's how organizations are connecting the technologies to make better business decisions.
" ...All of these new technologies are about making it easier to build and consume analytical applications," says Gartner Inc. analyst Kurt Schlegel. Today, he notes, companies frequently cite a lack of both end-user and developer skills as a major barrier when deploying traditional BI applications. Indeed, anecdotal evidence suggests that no more than 20% of users in most organizations use reporting, ad hoc query and online analytical processing tools on a regular basis. Instead, most companies rely on already overburdened IT departments or in-house teams of BI experts to fulfill users' requests for reports, analyses and forecasts, a process that can take weeks or longer. Then, when decision-makers finally receive a report, they often discount or distrust it because the data is no longer relevant or timely.... "
How many calories does it take for the human brain to think hard? Not many. And worse, does thinking hard make you overeat? Wal-Mart is rolling out what they call a next generation retail network to over 2700 stores starting this month. All about delivering the right message to the shopper at the right time and place. It's is also about the right content, infrastructure, modes of interaction and ability to remotely control the message. The data gathered will have value to better understand the shopper. Note the involvement of DS-IQ , to measure, analyze and optimize the consumer interaction.
" ... Walmart is the first retailer in the US to rollout a next generation retail media network that is supported by a flexible, open enterprise platform powered by Internet Protocol Television (IPTV) – technology that will allow the retailer to monitor and control more than 27,000 screens in more than 2700 stores across the country. The Walmart Smart Network will also deploy response measurement and message optimization technologies to enable delivery of the most relevant content to shoppers - by store, by screen, by day and by time-of-day. All of the content on the Walmart Smart Network will be customized, designed to deliver helpful product information to consumers at the point of decision when and where they need it in the store. “We’ve built a network tailored to the way consumers shop our stores – delivering helpful, custom, content closest to the point of decision – that helps them shop smarter,” said Stephen Quinn, chief marketing officer, Walmart Stores, U.S. “The Smart Network is intelligent too, because every screen and every message has a purpose and we will be analyzing point of sale data on an ongoing basis to deliver a shopper-centric communications platform. In short, the Walmart Smart Network is a win-win: improving the shopping experience for our customers and driving results for our supplier partners.” ... "
Comments on this blog are moderated. That means that if you post a comment I read it and I approve its publishing, often the same day. I have been getting increasing numbers of comments. Of course I will not approve Spam. I also will not approve comments that have little to do with the post commented on and are attempts to get an unrelated web site in my comment stream. I welcome and will approve any non-trivial comments, positive or negative, about what I write. Comments can be questions. I can sometimes provide more details about what I write. Feel free to contact me privately, many have and contacts have led to real collaboration, my email address is in the left column. I am trying to use only Linkedin so I won't join other social networks. Here is my Linkedin public profile. Most of us think that computers are very reliable. Sure they still sometimes freeze and we have to do drastic things to get them started again. Sometimes it is even required to do a power down like we had to do in the 80s. Things are much better than they used to be. It is rare now that you lose your work. It is still possible if you have a disk crash and were not careful to backup. Even simple computer failures are critical if the computer is running an aircraft or operating medical equipment. It is also not all about just hardware and software. It's about the computer and people that interact with the system. Even the design of an interface has led to fatal accidents. Ivars Peterson's mostly accessible 1995 book: Fatal Defect: Chasing Killer Computer Bugs, though now dated in its examples, is an introduction to the topic. (After I finished the book, I note that later chapters are IT technical and can likely be skipped). The book makes some good points, notably that it is impossible to build infallible computer systems. They are just too complex. Also, that a computer system is composed of user + interface + computing. And all of these are crucial. Today systems are connected to their environments with multiple sensors, leading to an even more complex and unpredictable set of inputs. In the midst of the book there is a chapter about the risks of the Y2K bug which was then in the future and is now eight years in the past. Of course Y2K turned out to be a minimal problem. My own company installed a huge generator outside the headquarters's back door to deal with forecast power grid failures caused by Y2K. Never used to my knowledge. The risk database linked to below has a great historical view of that event. That tale is also worth considering. Sometimes predictions are incorrect. SRI risks person Peter G. Neumann a key player in the book, was on a panel with me last year at IBM Almaden labs. He moderates a risks digest that is updated weekly. There is also an RSS feed. See also his book on Computer Related Risks. It is sobering to see the number of reports that come in about computing systems risks. I reported on Superstruct, IFTF's first MMFG--Massively Multiplayer Forecasting Game. Marina Gorbis writes that it has now been written up in Discover Magazine. Can crowdsourcing predict and thus invent the future? Good overview of the idea. May try my hand at it. More on serious games. In KurzweilAI, Intel says machines show they are approaching human intelligence. I am still skeptical, most examples are still in narrow focus areas. AdAge article with some interesting details of Kellog's efforts. "...The Sunday Express is angry that the government is considering a tax on disposable items such as razors and nappies to try to cut waste. The paper describes the move as a "cut-throat eco-tax", and elsewhere in the paper as "another tax con"..."
Package goods companies will have to consider this direction, I recall there was a consumer revolt in Germany and elsewhere in the 90s, where consumers were ripping removing packaging they thought to be extraneous from products and dropping it in store aisles. This led to packaging redesign that removed cardboard over-wrap from stick deodorant. A win for smaller government. The neuromarketing patent originally held by Gerald Zaltman of Harvard has changed hands .... which Nielsen has a major investment. Do "Systems dump excess energy in the form of structure." ? Provocative piece in Tim Oren's Due Diligence blog, always interesting. More details on Nielsen's In-Store metric program, which derived from the collaborative PRISM project. Previously on this, including mention of their innovation center. Good post from Knowledge@Wharton on how Google's new Chrome browser fits into their long term strategy." 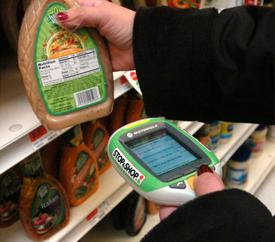 ... Google wants the new browser to influence the development of web technology that will help draw consumers to its various web applications, making Google overall more attractive to advertisers ... "
More on Stop&Shop's hand scanner broad deployment. Includes a video. Previously on this.
" ... These digital devices enable customers to weigh their own produce, order a variety of cold-cuts at the deli counter, by using a video touch screen, and pay without the assistance of a cashier. 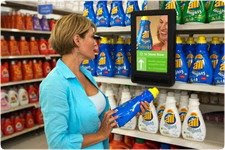 The digital gadget that customers will use for shopping is the "Scan It" personal scanner; the way it works is simple. You activate the scanner by reading the barcode on your Stop & Shop loyalty card. This card is similar to the ones use today by consumers for obtaining discounts on certain items. However this system is a lot smarter and also doubles as a sales person trying to get you to buy more groceries ... "
Heritance promotes open museum practices that foster diversity and good governance ..."
Good concept that was new to me. Check out the blog for more. I also like physical museums, last year I took in the MIT Museum, which also has a site. That brings to mind the notion that a physical museum is not and cannot be complete. It is more about theater than completeness. I have followed electronic signage for years, but this? : Electronic Billboards to Appear in Venice's St. Mark's Square. I wrote about Gene Smith's book: Tagging some time ago. Good introduction to tagging for social media. I am just re-examining. He now has a site which covers the book, has some book content and interviews worth examining. Finally got a chance to look at Microsoft's Photosynth. Its an alpha piece of 3D stitching software that allows you to take multiple pictures and combine them into a navigable 3D space. I have played with other packages that allowed you to stitch multiple pictures together to create 2D landscapes. For example, one project had me taking many pictures of supermarket shelves and then creating one long panoramic picture of the shelf to analyze where out-of-stock conditions might exist. Photosynth takes it a bit further, creating at least the illusion of three dimensions that you can then navigate within. There are lots of good examples in the Photosynth site. A good example are a number of synths done of houses along the canals in Venice. Its sort of an obvious example, similar to taking pictures of a shelf in a store. Recent examples highlighted in their blog include using Photosyth to create wedding pictures. In its current form it seems more like a way to create art rather than precision images, since you are not controlling the stitching. It only works directly with XP and Vista, though it says there are ways you can get it on a Mac. The synth can be shared and embedded. It is recommended that you overlap adjacent images by at least 50% and not take adjacent images at very different angles. Photosynth works best with still things, not with people. The synths you create appear to be searchable publicly on the Photosynth site and cannot be made private. The viewer is a bit odd, you can zoom into a picture, but you cannot then navigate in the zoomed mode. Overall a good experience. Still experimenting. I had previously experimented with Autostitch from the U of BC, which also worked well for my purposes. The Google Chrome open source browser is being launched today. There is a cartoon introduction here. Some early comments. Nervous about giving another piece of my infrastructure to Google, though I gave it to Microsoft for years. Will wait and see how it 'drives innovation'. AdAge says it's all about Google's advertising model. Update: Does their user license claim owership of everything? Do Schools Kill Creativity? A Ted talk on creativity and education by Ken Robinson. " ... an entertaining and profoundly moving case for creating an education system that nurtures (rather than undermines) creativity ... ". Thanks to Aylin Koca. Have been browsing Guesstimation: Solving the World's Problems on the Back of a Cocktail Napkin by Lawrence Weinstein and John A. Adam for a few weeks now. I was pleased when I saw the local high school including instruction in some of these style techniques. They did not go far enough, but it was a noble effort. It's all about estimating solutions to problems. I remember being fascinated by these methods when I learned scientific notation in school. That added to just a bit of clever thought, can solve some very tough problems. You can see excellent archived examples at the Guesstimation site. You can solve tough problems without calculator or computers, a joy for the quant in us. A slight criticism is that they should have used more meaningful illustrations to help the visual thinker. A bit related, but different: How to Measure Anything: Finding the Value of "Intangibles" in Business by Douglas W. Hubbard. On my list. Last week I happened on the IEEE virtual museum, a group of history and background articles on electrical engineering topics. Looking more closely, it is only infrequently updated with new content. Made me think about the distribution of public knowledge on the Web. Things like the IEEE virtual museum were once commonly established on the WP. I rarely think about them as a source of knowledge these days. I need some combination of both coverage and accuracy to make me think of using a Web source. The IEEE sources are no doubt accurate, those I scanned looked good, though not as deep nor broad as I would have liked. Each had a much longer and recently updated article in the Wikipedia (WP). Accepting the accuracy of a WP article can be dangerous, they can be inaccurate, biased in sometimes obvious, sometimes arcane ways. Usually strongly dependent on the category of the knowledge. Watch out especially for politics, religion and issues of national pride. No surprise, but even aspects of science and technology can get caught up in these. I could simply search, of course. If what I am searching for has a commercial meaning it brings back so much noise that its not useful except by lots of followup searches. I have liked the fact that in recent years the WP entry shows up high for many searches since it allows me a basic grounding before I dive into commercial results. Organizations like the IEEE should use places like the WP to place their articles in useful categories. The WP already does this with generalized topic articles, almost essays about the field, which then point to detailed articles. The IEEE could be given editorial privileges, and even 'advertise' membership. The WP gets credibility, the IEEE gets more hits and memberships.